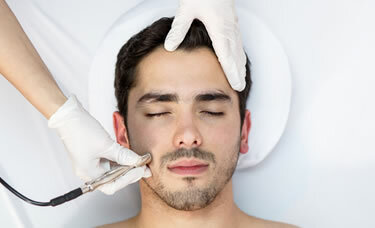 Microdermabrasion is a facial procedure that exfoliates to remove the outer layer of the skin. At eclectica Hair Design & Spa, we use a diamond tipped technology to remove dead or damaged skin cells. Skin will appear softer, smoother, brighter, clearer and younger looking. This treatment is offered to both men and women of any skin type or colour. Anyone with aging, flaky, dry, blemished and sun damaged skin will see their skin rejuvenated. Any area of the body can be treated, however the most common areas for this treatment are the face, neck, shoulders, knees and elbows. Microdermabrasion is a type of exfoliation which is performed with a diamond tip passing over the skin’s surface by creating a gentle vacuum. Approximately 20-25 microns of dead skin cells of the outermost layer are exfoliated during this treatment. There is no downtime associated with diamond dermabrasion, as there are minimal side effects and results may be visible after only one session. While the recommended number of treatments are six, we encourage you to book a consultation for more information.